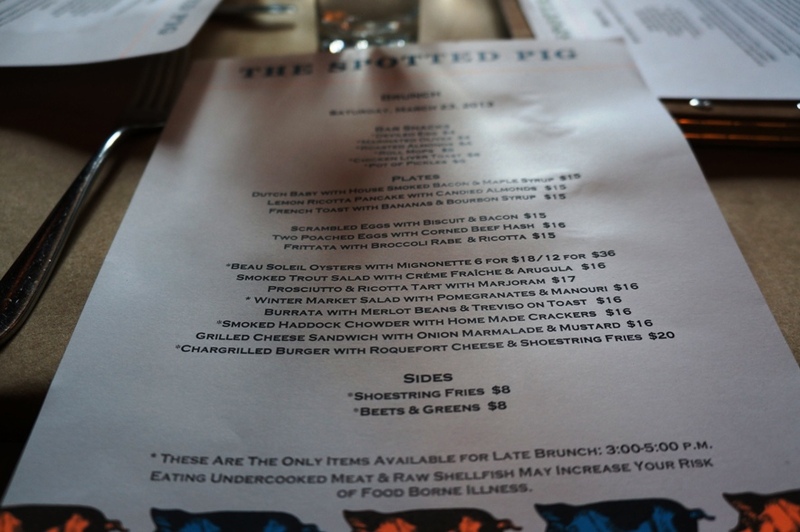 Immediately after opening in 2004, the Spotted Pig became a New York hot spot. 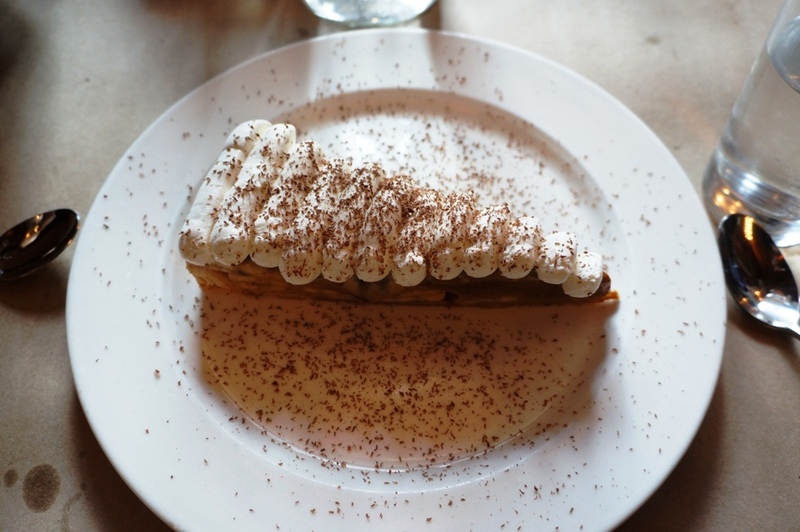 With chef and co-owner April Bloomfield behind the reigns, the restaurant has one Michelin star under its belt and a hoard of hungry patrons each night waiting hours for a table. 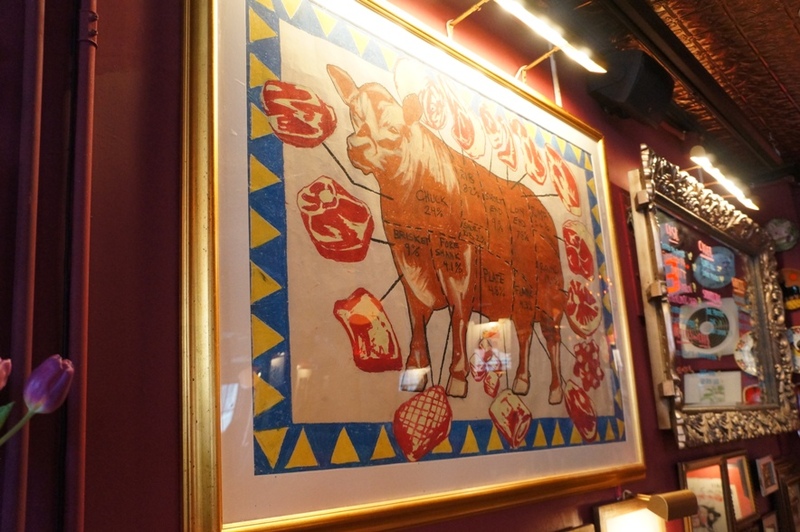 This gastropub doesn’t take reservations so they’re notorious for their long waits. 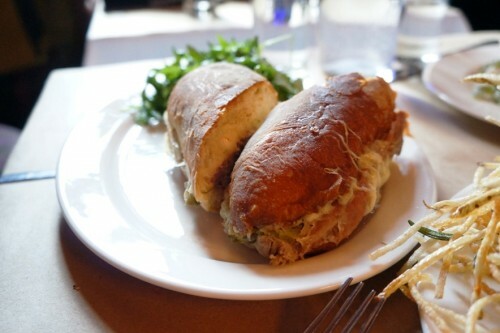 If you can, I’d recommend dropping by for lunch when there usually isn’t a wait. Our party of three came for brunch on a Saturday around 11:30 and had a 45 minute wait. They’ll take your number and will give you a call when your table is almost ready. The space has two levels and seats around 100. The atmosphere is casual and the décor is pretty kitchy with mismatched furniture and random stools for seating (you get the idea – it’s not the most comfortable space). The upper level has a waiting/bar area which actually got pretty loud and rowdy during our meal. 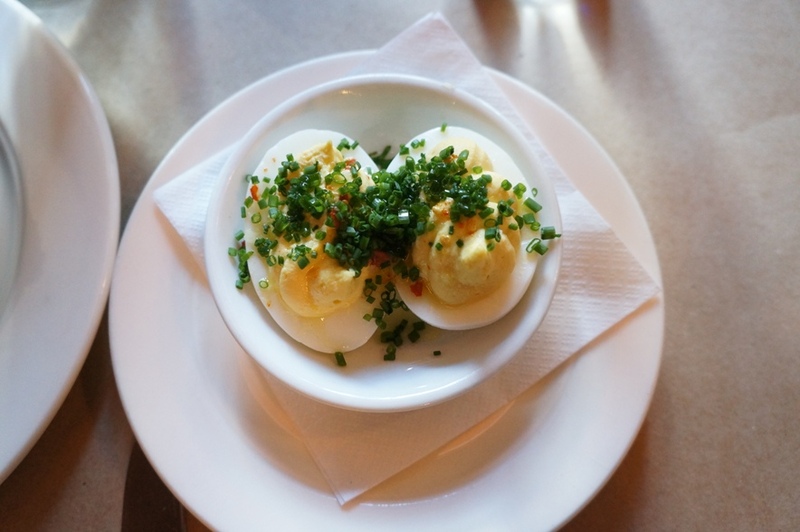 From the “Bar Snacks” section of their menu, we ordered the Deviled Egg ($4). It comes with one egg (sliced in half) with the usual filling and topped with chives. 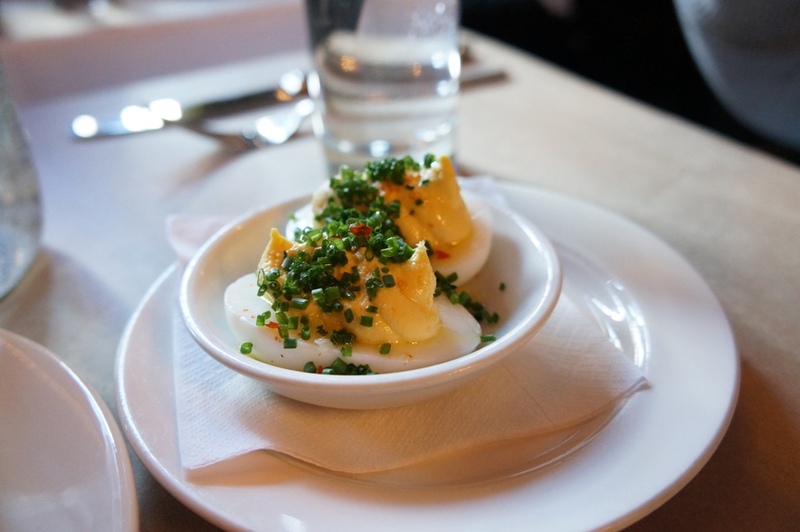 It was good but nothing memorable…but in all honesty, I’ve never eaten a truly memorable deviled egg. We also started off with the Chicken Liver Toast ($6) which comes with two pieces of grilled bread topped with buttery chicken liver which is made with a port and madeira sauce. 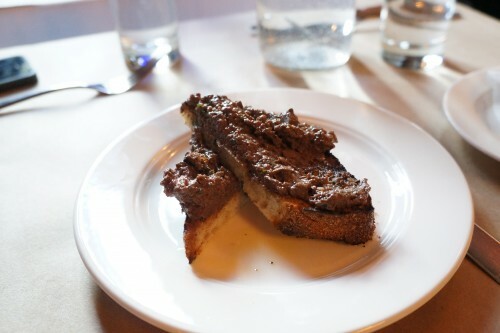 It’s not the prettiest dish but it’s difficult to make liver look appealing. Nevertheless, it was delicious and fared much better than the deviled egg. 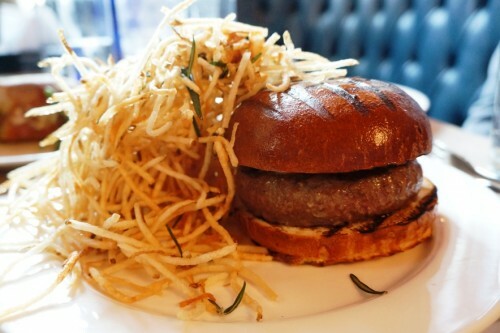 We had to order the Spotted Pig’s famous Chargrilled Burger – with Roquefort cheese and shoestring fries ($20). Given all the high praise this burger has received, I was pretty let down. It was a decent burger but like the deviled egg, none of us found it to be anything memorable. 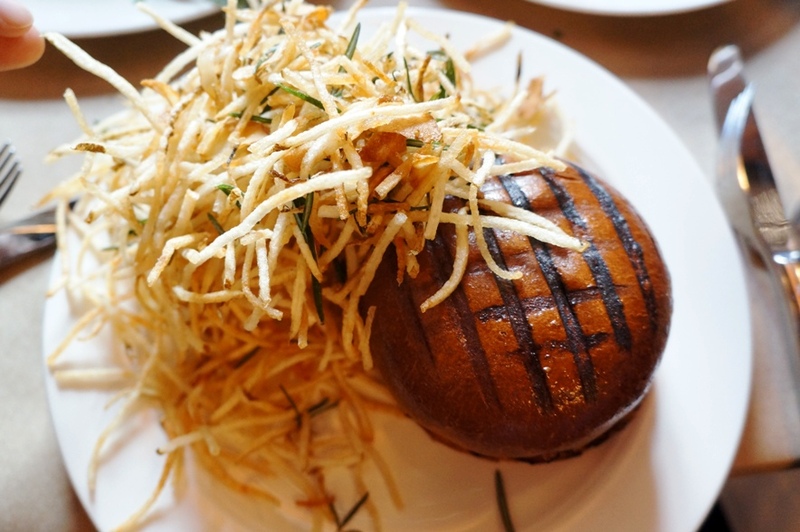 The burger was cooked medium rare, just like we had asked and was served on a brioche bun which was perfect for the size of the patty. It really bugs me when the bun-to-patty ratio is off. The patty, made from brisket, rump and chuck meat, was quite juicy. 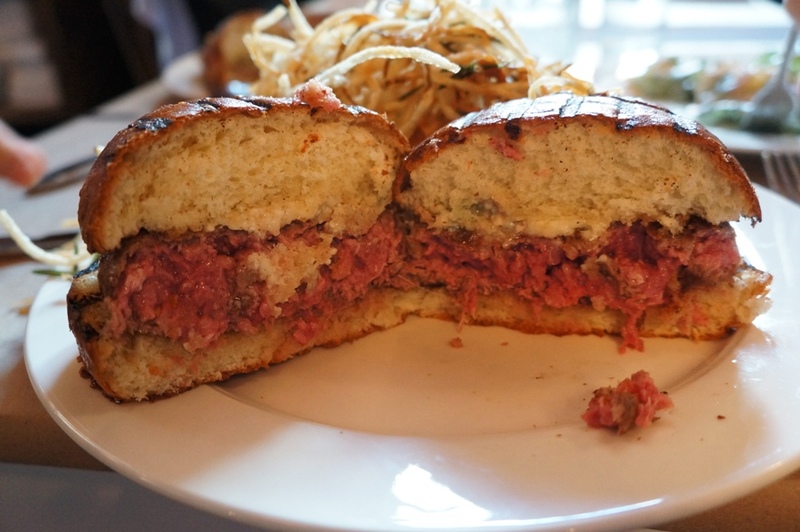 The patty was topped with a generous amount of crumbled blue cheese. I’m personally not a huge fan of blue cheese but I don’t mind it if it’s not too overpowering. Perhaps our blue cheese wasn’t crumbled on evenly because I found some bites to be quite enjoyable while other bites would be filled with a large clump of blue cheese which would overpower the burger. 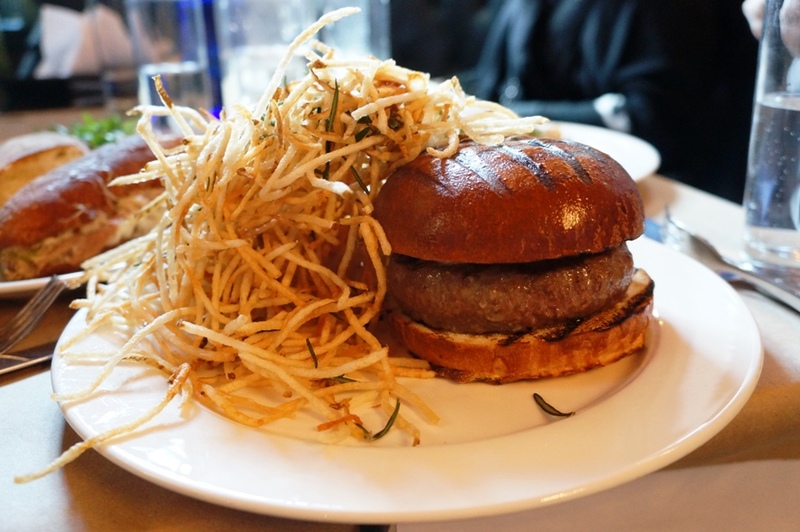 The burger came with a heaping pile of rosemary garlic shoestring fries which we couldn’t stop eating! Since they’re so thin, we’d just grab a handful and stuff them in our mouths. Not a pretty picture…but hey, who are we trying to impress? 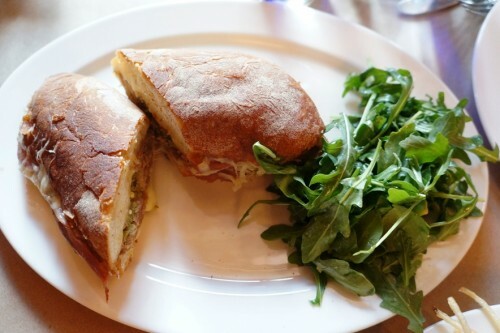 We also shared the Cubano Sandwich – with mixed greens ($18). Again, this was good but not great. I think you’re starting to see a pattern here. 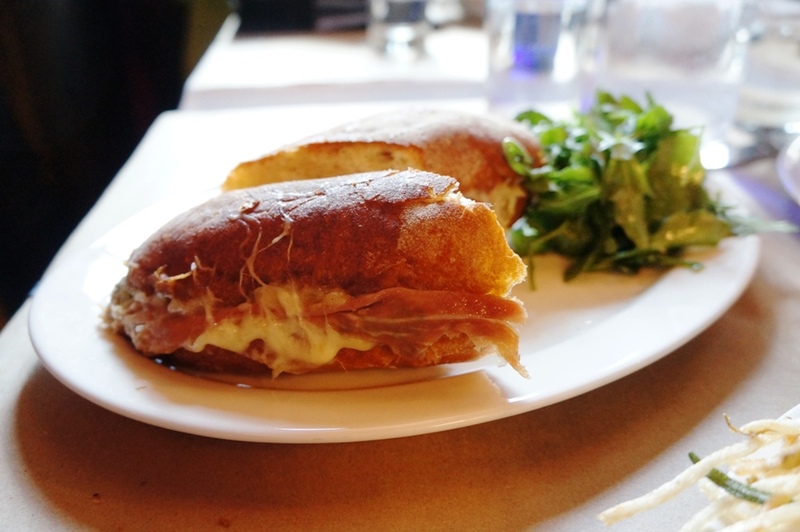 It’s definitely not a traditional Cubano sandwich – this one consisted of prosciutto, gruyere cheese, pickled jalapenos and pork shoulder meat on some crusty bread. I really enjoyed the pickled jalapenos which gave the sandwich a bit of a kick. But like I said…it was good but not great. 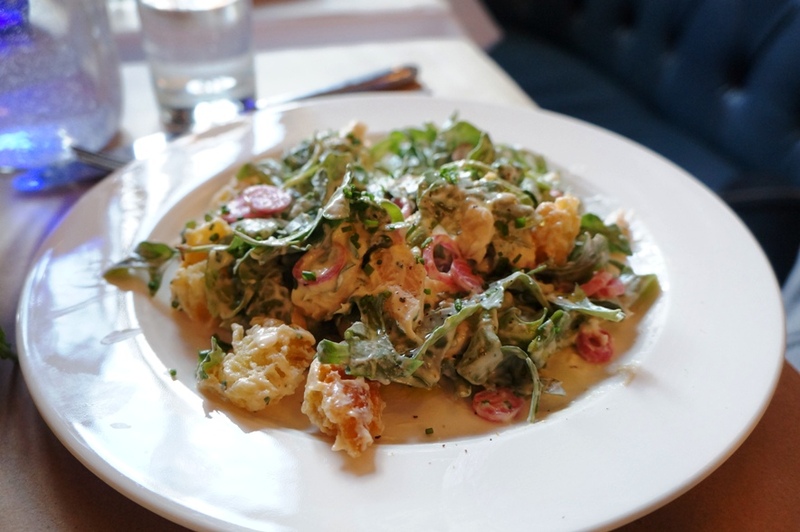 For something a little “lighter”, we ordered the Smoked Trout Salad – with crème fraiche and arugula ($16). While the smoked trout was nice and I enjoyed the addition of the pickled onions, I found the salad too heavy on the dressing. I actually found the best part of the salad to be the croutons…they were really, really good! It was easily the best thing we ate at the Spotted Pig. 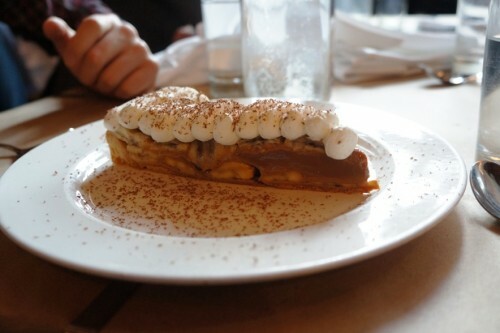 Slices of bananas sitting on a shortbread crust and topped with cream, this was one of the best desserts I’ve had in a while. 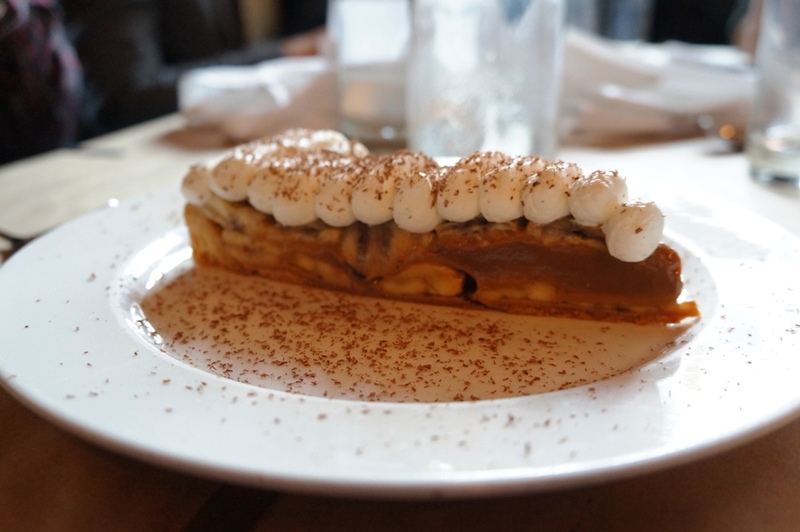 It wasn’t too heavy, had just the right amount of sweetness and left us wanting more. Definitely a must-order! Ahh, I have a soft spot for this place because my fiancé and I had our first date here. I had the pasta special and it was pretty good, but it did get pretty rowdy upstairs. The bar/waiting area upstairs is really cramped, but I guess that’s NY for ya. With all the hype surrounding this restaurant, I guess I just expected to be blown away. It was a good meal…just not an amazing one, unfortunately.